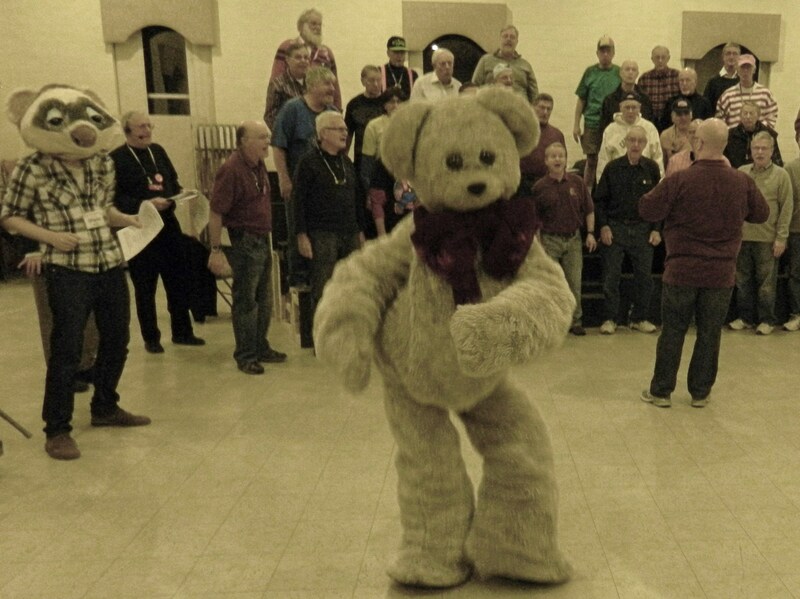 A first ever creative collaboration between two extraordinary and highly regarded groups, the Silk City Chorus barbershoppers and the University of Connecticut Puppet Arts Program, titled “I’m Your Puppet!”, is set to take center stage Saturday night, January 24, in Manchester, Connecticut. 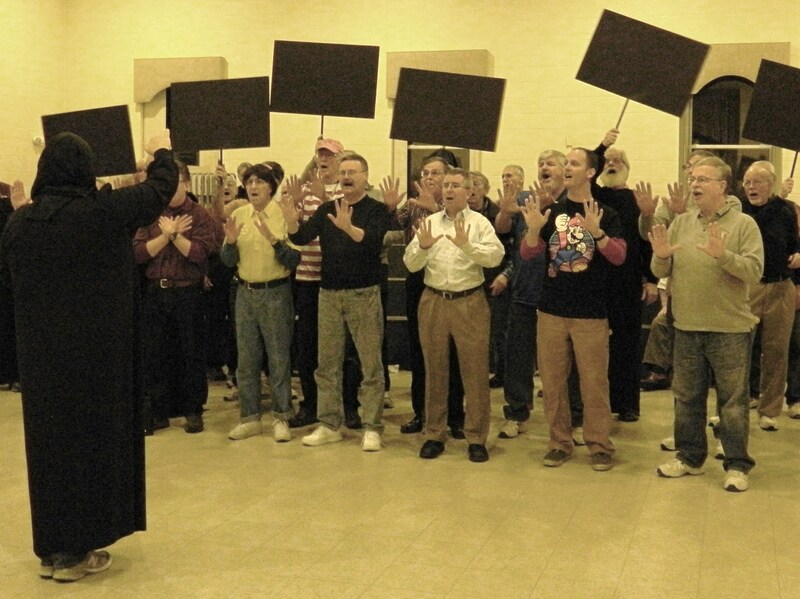 Members of the Silk City Chorus croon out “Rubber Duckie You’re the One” January 19, 2015 at the Second Congregational Church rehearsal hall in Manchester, Connecticut. “This is the first time something like this has been tried by the Barbershop Harmony Society, an international organization. The Silk City Chorus (an 80-man chapter) has been working on the collaboration with Bart Roccoberton, director of the UConn Puppet Arts Program, and students from UConn for a year,” Neal Kellogg, director of marketing and communication for the Silk City Chorus, said during a behind-the-scenes interview with newsandviewsjb January 19, at the Second Congregational Church rehearsal hall in Manchester. 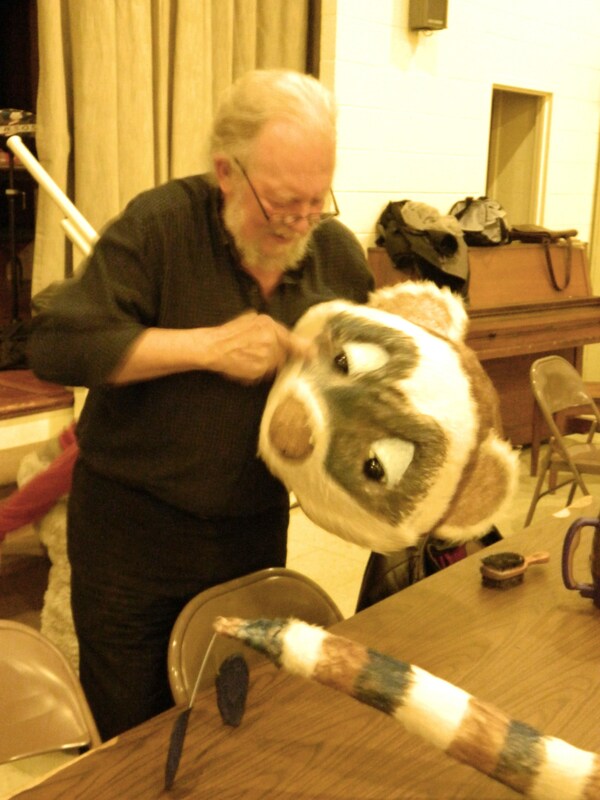 Bartolo “Bart” Roccoberton, director of the UConn Puppet Arts Program, makes some adjustments to the Teddy Bear head. “We were very lucky, Bart, the chief of the puppetry program at UConn attended our show last year, the theme was ‘Pirates’,” added Kellogg. Each January the Silk City Chorus – SCC – puts on its biggest annual show in Manchester, drawing audiences from near and far. “I was invited to last year’s (Silk City Chorus) show. We watched, and they suggested a collaboration,” explained Bartolo “Bart” Roccoberton, as he worked on the head of the Teddy Bear puppet. 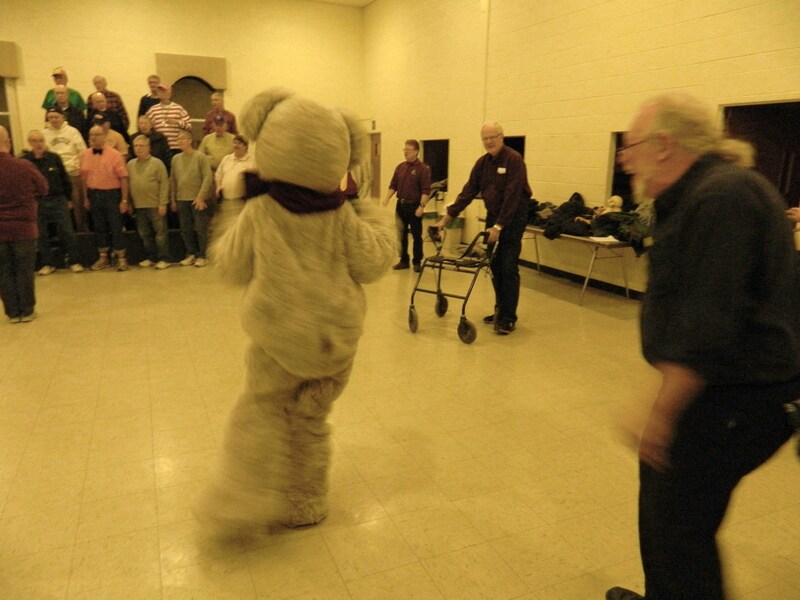 Participation by the UConn program in “I’m Your Puppet” is being funded through an Innovation Grant received by the SCC from the Harmony Foundation. The idea of the grant is to encourage barbershoppers to step outside the box of their normal performance approach, according to Kellogg. The Manchester chapter, he said, tries each year to come up with fresh themes for their shows and saw a tremendous opportunity to tap the nearby UConn puppetry program in Storrs as a resource. It is not only one of just a few of its kind in the United States but one of the most highly respected in the country, Kellogg added. “We felt so fortunate when they agreed to collaborate with us this year and honored that their director, Bartolo Roccoberton, felt the same about us. Together, we felt this would be an unlikely and unforgettable pairing of skills,” he continued. The UConn pupperty program was started by Frank Ballard who was succeeded by Roccoberton twenty-five years ago. 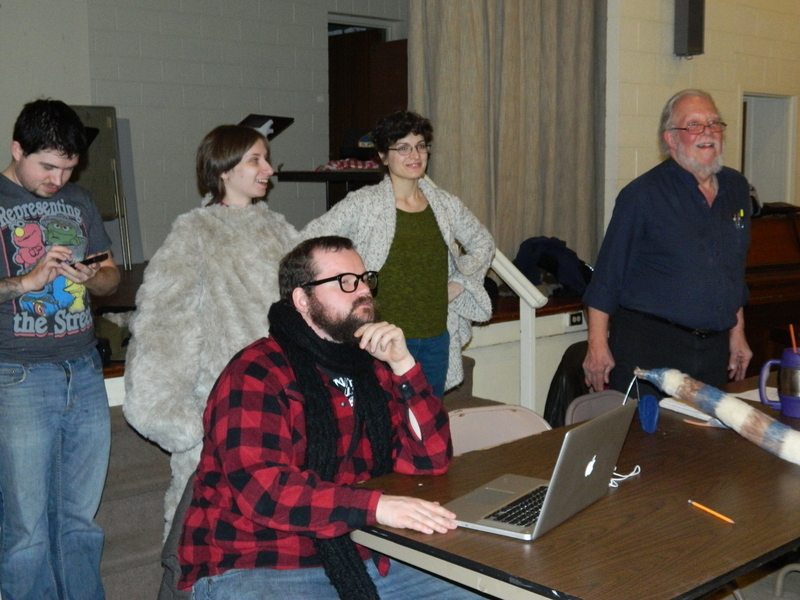 In addition to the collaboration with the Silk City Chorus, concurrently the students are building opera puppets for a collaboration with the Connecticut Repertory Theatre – two very different venues, noted Roccoberton. Celebrating its 50th year, the UConn program will host a National Puppetry Festival from August 10-15. Registration began this month – go to PUPPETFEST@UCONN.EDU. The anniversary is no small feat; for many years the puppetry program was first on the chopping block when it came to budget cuts, recalled Roccoberton. Now, it also has a museum in Storrs Center, the Ballard Institute and Museum of Puppetry. Did time spent with the SCC present any unusual challenges? “It’s always a challenge and I love that,” said Roccoberton. Working with various groups such as the SCC is rewarding he said, because it gives students a chance to apply their knowledge. The also acclaimed SCC has been making music for more than fifty years. 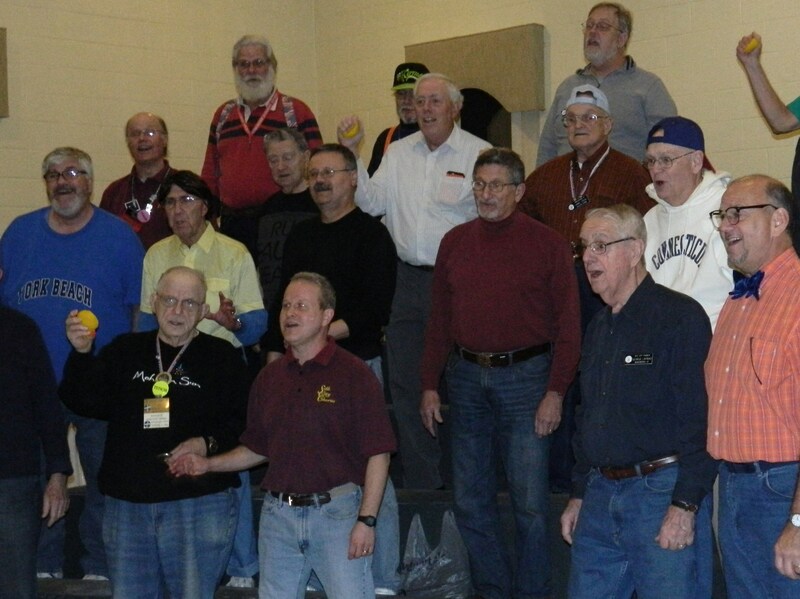 Sought out for performances across Connecticut and beyond, it is an award-winning barbershop style singing group and member of the Barbershop Harmony Society. “A cappella groups have become very popular on college campuses,” Kellogg pointed out. SCC quartets compete across the region and are well-known for the Singing Valentines they offer each February. “February is always a very busy time for us,” said Kellogg. In fact, the SCC quartet “Off the Chart” serenaded Nancy Wyman, the state’s lieutenant governor, with a Singing Valentine last February 14. As well, SCC has been selected to act as a presenting sponsor for a special program at Nevers Park in South Windsor this coming summer called “Circus Smirkus” – an award-winning international youth circus out of Vermont. “It’s a pretty big deal,” noted Kellogg. UConn junior Hailey Bendar plays the Teddy Bear. 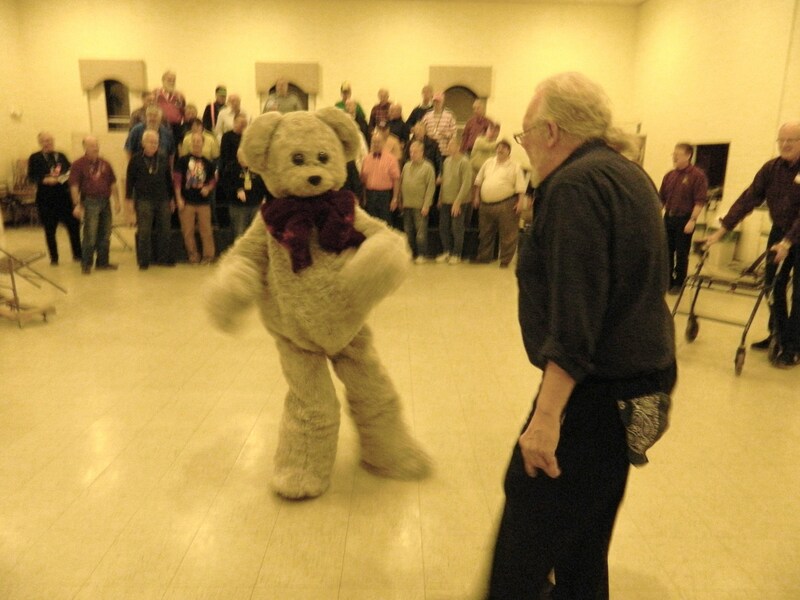 So, why is the Teddy Bear considered a puppet? “It is something that isn’t necessarily alive; inanimate. A character that I have to create, it becomes a character separate from me,” she said. A black light will used for this number so all the audience will see is the motion of hands in white – thus, the chorus director is shrouded in a black hooded robe. Also involved in the project are UConn students Kalob Martinez, Nic Parks, Ana Craciun, Shane McNeal and Chris Mullens. Clearly, these puppets not only tickle but stretch the imagination. 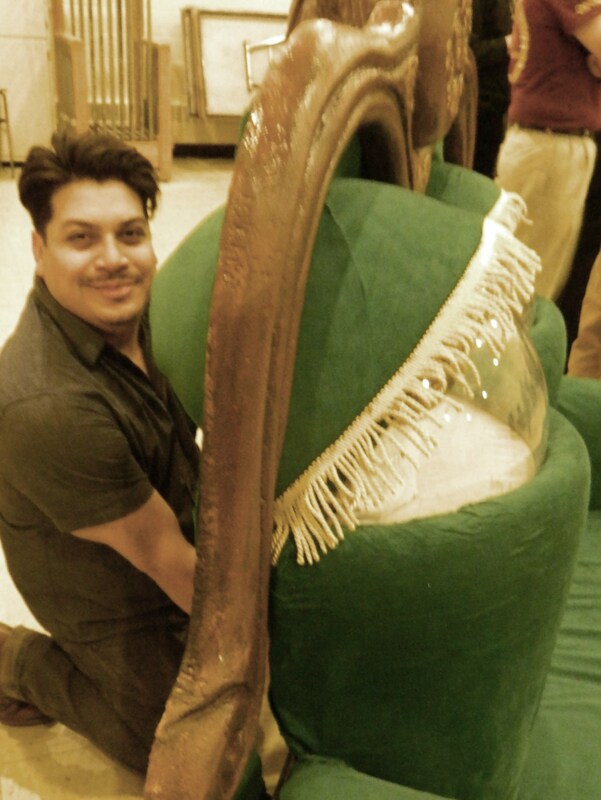 For example, Martinez has spent the last two weeks building a green couch puppet – yes, a green couch puppet. 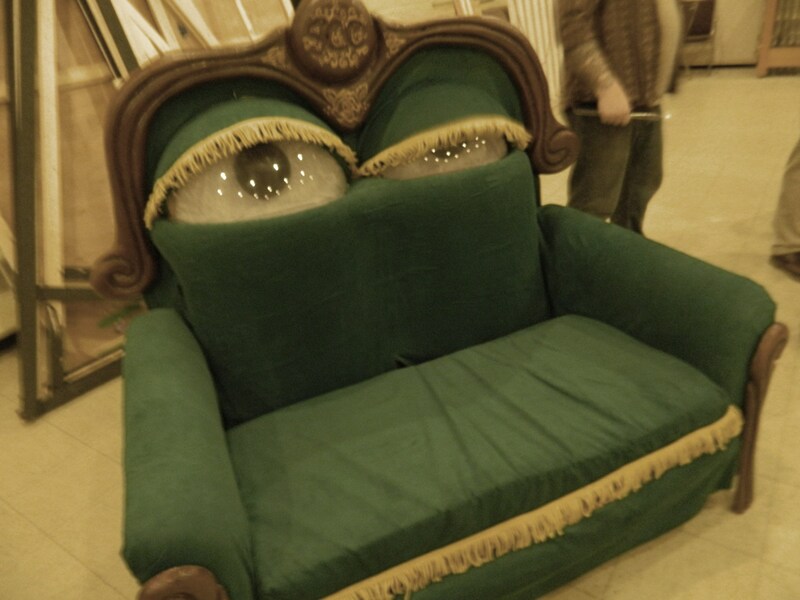 UConn student Kalob Martinez spent the past two weeks building this couch puppet. What song could be more perfect for SCC to perform to tell this puppet’s story than – “It’s Not Easy Being Green”. It is among a medley of songs from “Sesame Street” that will be part of the show in reverence to the late American puppeteer Jim Henson of “Sesame Street” and “The Muppets” fame. “As a tip of the hat to Jim Henson,” said Kellogg. The show will feature local and visiting quartets. 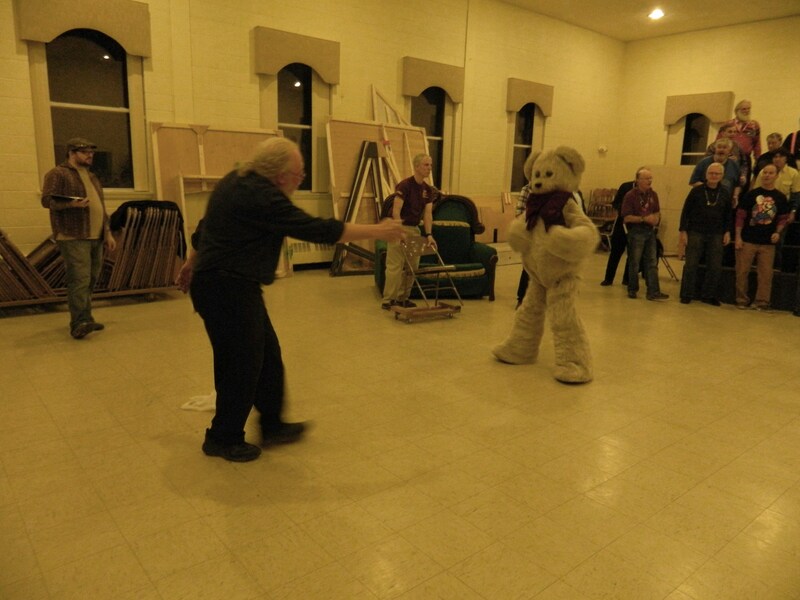 “I’m Your Puppet!” Saturday, January 24, 2015, Manchester High School, 134 Middle Turnpike East, Manchester, CT 06040. Advance Seating – Primary $28., Secondary $23., Classic $20., Standard $17 and, Afterglow at Marco Polo Restaurant 1250 Burnside Ave. East Hartford CT 06108 – $15 – all seats are reserved. For seating go to http://www.silkcitychorus.org/tickets or, call 860-298-8820, or write Jerry Wistrom, 23 Country Club Drive, Windsor, CT. 06095.